Pragmatic Mom has battled lice twice thus far. Between my school’s PTO website, the summer camp nurse and the web, I found a plethora of information both helpful and confusing. This is what I found to be successful in eradicating lice. I hope this helps you in your battle against head lice. First of all, if you suspect your child has been exposed to lice, Pragmatic Mom suggests you watch this short video before you begin: www.HeadLicetoDeadLice.com. Not sure what to look for? The easiest thing to spot is small, white, grain-of-sand-sized eggs (nits) that will be “super-glued” to a hair shaft. If you can flick or blow away the white blog, IT IS NOT LICE EGGS. You will have to grasp it between two fingers and slide it off the hair shaft if it is lice. Live eggs or nits are brown or grey in color and the younger the egg, the smaller it is. Live eggs will be very close to the scalp, about a quarter inch. White eggs are dead eggs (i.e. the egg has hatched and the white egg is just the husk). The white eggs can be further down the hair shaft, from a quarter of an inch on down. Stand in natural light. If you are over 40, a magnifying glass is recommended. Check carefully starting at the hair around the forehead back to the crown of the head. The white eggs will be the easiest to spot but look carefully for the live eggs. Next check the hair behind the ears and at the nape of the neck. These are the most common spots for lice to lay their eggs. Finally, use hair clips to separate out sections of hair and using a comb, check section by section taking a width of hair no thicker than the width of the comb. The nurse who helped me thinks this is easiest done with the hair dry. I find that wet hair is easier to section off and see a contrast of egg against black hair. Wet or dry, check very carefully. It takes me about 15-20 minutes a head to check carefully. What happens if you find eggs or lice? First, Pragmatic Mom says to Take A Deep Breath. Yes, lice is totally disgusting and even a bit shameful, but it’s not life threatening! If you detect lice, the first thing you should do is check everyone in your household including yourself. You’ll need help to check yourself. While everyone will recommend a lice shampoo or even a prescription lice shampoo, I opine that since lice shampoo is not 100% effective, it doesn’t make sense to expose your kid to harmful chemicals if it doesn’t actually work. If you see live lice, it can be hard to remove them as they are pretty fast on the head. And, it is pretty disgusting to find live lice on your child so Pragmatic Mom understands the need to kill them as fast as possible. Pragmatic Mom suggests killing live lice using an electronic comb called the Robi Comb. Most drug store chains don’t carry this, so Pragmatic Mom suggests buying it online from Amazon. Yes, that does mean you have to buy in advance, just in case. 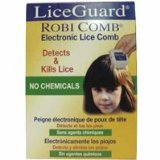 Some independent drug stores do carry the Robi Comb so call first if you didn’t stock up before your lice outbreak. The Robi Comb doesn’t really work that well for nits (eggs) because it’s basically a lice comb that zaps anything that gets caught between the tines of the comb. It works well for lice, but it will also zap a hair snarl or an ear if you accidentally get too close to the ear. Pragmatic Mom’s kids hate getting zapped. Pragmatic Mom thinks the eggs are too small to get caught in the tines of the comb, so the lice eggs still need to be meticulously removed. Please note that the hair HAS TO BE DRY for this comb to work. The Robi Comb is also great if you’ve learned that your child has been exposed to lice and need to do a lice check yourself. You run the comb through your child’s hair, and if anything is detected, the comb will stop buzzing. There are lots of false positives if you hit a hair snarl, but then you know which area to focus on for a manual search. If there are live lice bugs in your child’s hair, the Robi comb electrocutes them dead, and the bugs will also be stuck on the comb. If you are going to eradicate lice by solely using the Robi Comb, you need to spend at least 5 minutes a day running the comb through your child’s dry, unknotted hair for 30 days. This length of time is necessary to break the cycle of lice. Pragmatic Mom suggests that even if you go the Robi Comb method, you still need to manually check for and remove eggs. The following instructions have been given to parents from The Pediatrics at Newton Wellesley practice, as well as by some professional nitpickers, and have proved to be effective. It may be messy and time-consuming, but if the directions are followed properly, the lice and nits will be eliminated. Have the child change into old clothes that can get stained. Also use an old towel around the child neck to catch any drips. 1. The oil must fully saturate the scalp and coat the hair. Use a plastic applicator, similar to those used to apply hair color. Apply in small sections. Use a large plastic comb to comb the oil thru long or thick hair. The oil does not need to be dripping, just saturated. 2. Place a shower cap or swim cap around the head to provide an airtight and oil saturated environment. You could even tie an old bandana around the shower cap, so it won’t move around. Pragmatic Mom uses a disposable shower camp on the bottom and a swim cap on top. 3. Leave on for at least 8 hours or overnight. It is easier to sleep through this process. Place an old towel on the child’s pillow, to prevent staining. 4. After at least 8 hours remove the wrapping, but keep the oil in the hair. Divide the hair into several small sections, and comb thru each section with the metal LICE or NIT comb. Pay special attention to combing the scalp, and all the way down the hair shaft. Sometimes the lice will try to move around against the scalp (not all may be smothered, but the rest will be slowed down “a lot” from the oil). Wipe the lice comb on a white tissue/paper towel, and dispose of in a plastic bag. 5. Shampoo the hair with a good clarifying or purifying shampoo – this may take a couple of soapings. 6. You must still concentrate on nit removal – using a good NIT comb with small tines. This is best done on dry hair, in direct sunlight. For girls with curly hair, you can blow dry or use a straightened to straighten hair, to see them easier. 7. Because nits hatch every 7-10 days, the Harvard School of Public Health recommends that you repeat the oil process on days 1, 2, 5, 9, 13, 17 and 21. These particular days must be followed to get the nit at the proper time in their developmental cycle. Parents may use olive oil other days, but it must be done on the days outlined above. Pragmatic Mom thinks that a few precautions will go a long way in preventing lice from coming into your home. If your child has long hair, keep it tied back. A pony tail is good but a bun is even better. Don’t share hats or helmets; if your child uses a batting helmet you might want to consider buying your own. Avoid using shared helmets at activities such as pony rides or batting cages. Don’t try on Halloween costumes at the store, particularly the masks with fake hair. If your child hangs his or her coat on a hook at school, keep it instead in a zipped up backpack. Talk to your child about being mindful of not touching heads when hugging or standing close to your friend. If you live somewhere where lice is prevalent, you might want to consider a weekly lice check at home. Buy online: terminator lice comb and robi comb. Test the robi comb once you get it to make sure it works. A magnifying glass if you think you’ll need it.